It has a lot to do with choice of major. Oh, and sexism. 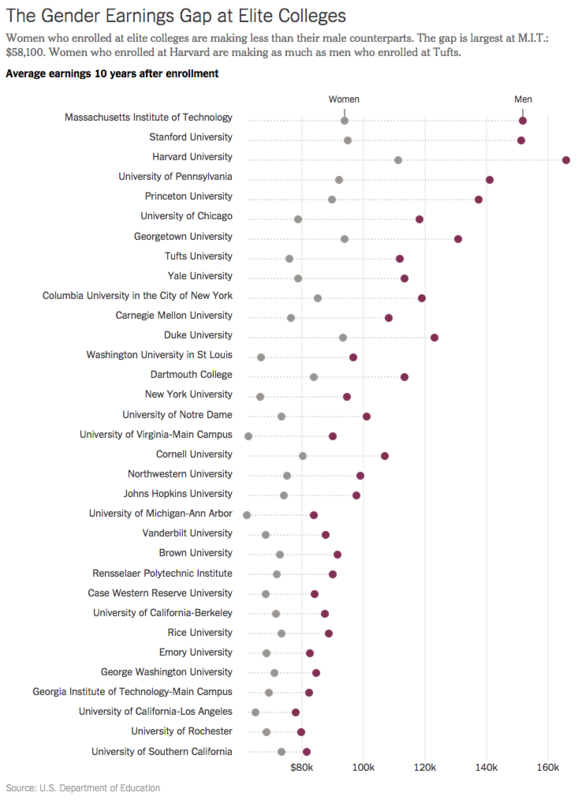 Some of these Harvard grads are going to crush their peers when it comes to income. Attending the country's most prestigious schools doesn’t make you immune to the unfortunate societal stew of sexism, bias and history that drives the income gap between men and women in the U.S.
Men who graduate from the country’s most exclusive universities vastly outearn their female counterparts, according to startling statistics released over the weekend by the Department of Education. Ten years after starting at Harvard University, men make on average $53,600 more per year than women who graduated from the school. That's a lot of money -- roughly equivalent to the U.S. median income. This is the pattern at all of the country's elite schools, as The New York Times reported. The gulf is widest at the Massachusetts Institute of Technology, where men outearn female graduates by an eye-popping $58,100 a year, the Times noted. Graphic by the New York Times, used with permission. Much of the gender wage gap can be traced back to men and women’s choice of college major, experts told The Huffington Post. However, that doesn’t necessarily mean the brightest, most successful women in the country are voluntarily deciding to make less money than men. The choice to move away from STEM majors -- those in science, tech and engineering that generally lead to high-paying jobs -- comes after years of subtle biases that often steer young girls into the social sciences and humanities. A decade after starting college, the average female Carnegie Mellon graduate earns an average of $76,200; their male counterparts earn $108,000. An overwhelming majority of social science majors at the university are women, Babcock said. If you compare the incomes of men and women who major in the same subject, about half of the gender gap disappears, said Amelia Haviland, one of Babcock’s colleagues at Carnegie Mellon. Still, even when they major in the same subjects as men, women often end up taking less lucrative jobs after school. More women now major in math than men, Haviland noted, yet there remains a big gap between what male and female math majors earn. Men are more likely to become actuaries (salaries can reach as high as $250,000 a year); women more often wind up teaching in high school, where salaries are lower. If you then take into account the fact that women are more likely to drop out of the workforce at different times for child-caring, the gap shrinks some more. The penalty women face in their careers for having children is what's really holding women's pay back, Claudia Goldin, an economics professor at Harvard, told HuffPost. “The real issue is what happens after [graduation] -- at 10 to 15 years out the gaps are huge,” said Goldin, who is currently heading up a big cross-university program that aims to get more women into economics, a field in which they're underrepresented. As awareness of this problem grows, a lot of schools and companies are trying to push more women toward computer science and engineering. “Across the university many of us are very passionate about understanding this," Pulin Sanghvi, executive director of career services at Princeton, told The Huffington Post. At the start of the year, the Ivy League school convened a diversity inclusion committee in the career services department, focused on not only gender, but ethnicity. Princeton's gender income gap falls slightly below Harvard's, according to the Department of Education's data. Babcock notes there’s a lot of subtle things going on that push young women away from studying STEM -- peers might discourage girls from the “boy subjects,” and there are few role models in the media for females. I remember, decades ago, wondering what happened to all the girls in my honors science and math classes when I showed up on the first day of eighth grade. The following year, there were only two girls in my Advanced Placement biology class. It wasn't exactly an encouraging situation. My bio teacher once paused in the middle of a lecture to tell me I was pretty.